With larger profile, lighter weight parts, the aerospace industry faces the daunting challenge of moving large parts in the most efficient way possible, in the smallest amount of space. 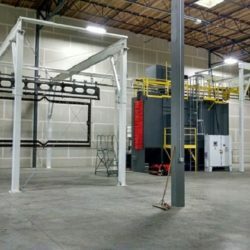 The modularity of IntelliTrak’s friction drive system (no chains) and support structure (bolted, not welded) makes it easy to integrate lifts and shuttles, making it the definitive solution for moving large aerospace parts in the smallest amount of floor space possible—no large turns required. In addition, operators on the assembly line are now able to lift, lower and rotate large parts ergonomically. Creative solution for moving a very long part in a small space. 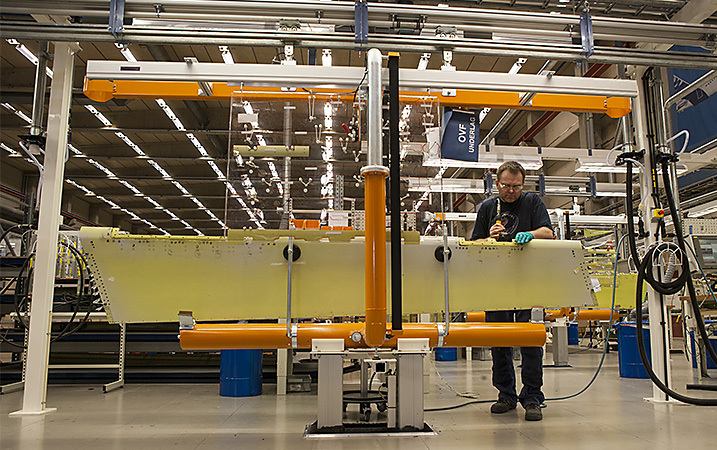 Ergonomic solution for assembly of large airplane parts. IntelliTrak’s innovative technology reduces TAKT time and expands capabilities. A creative solution for moving a very long part in a small space. Manufacturer of aerospace components needed a finishing conveyor system for a long composite plane part. With limited space for new construction and multiple lanes and lifts required for throughput, a standard conveyor system just wouldn’t work. 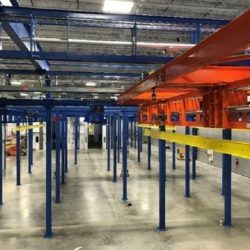 This IntelliTrak 500 Series Overhead Conveyor system consisted of a driven line with multiple workstations and buffer areas. 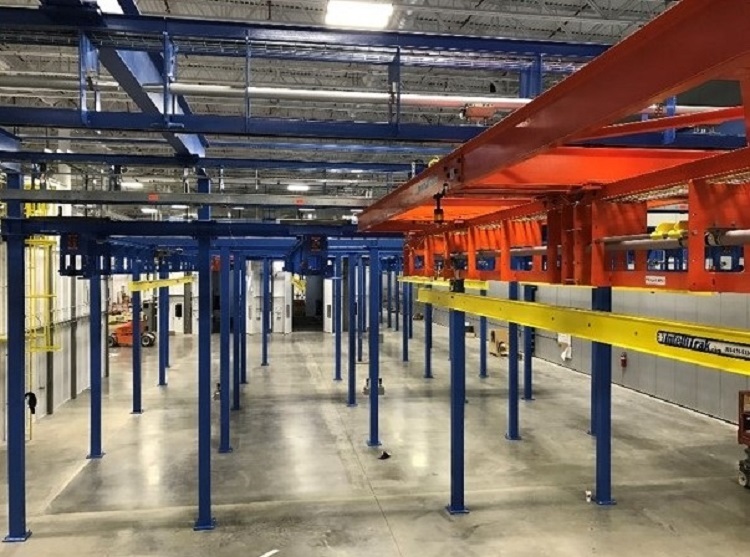 With a custom-designed overhead conveyor and product carrier, operators on the assembly line are now able to lift, lower and rotate large parts ergonomically. Opportunity: A family-owned finishing company needed a flexible and expandable conveyor system that would provide the highest quality application in a timely and consistent manner using some of the most advanced technology available. 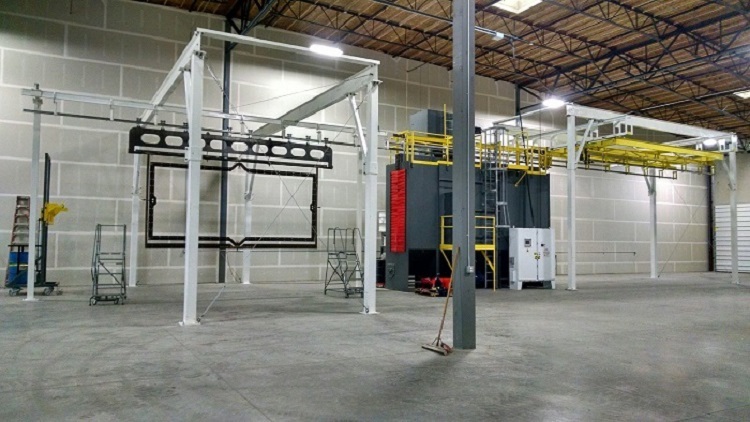 Solution: An IntelliTrak 500 Series Overhead Conveyor equipped with a glide switch, 3-stage washer, 2 spray booths and 2-lane curing oven. The innovative glide switch reduced TAKT time, allowing production and delivery schedules to be met. And flexibility? 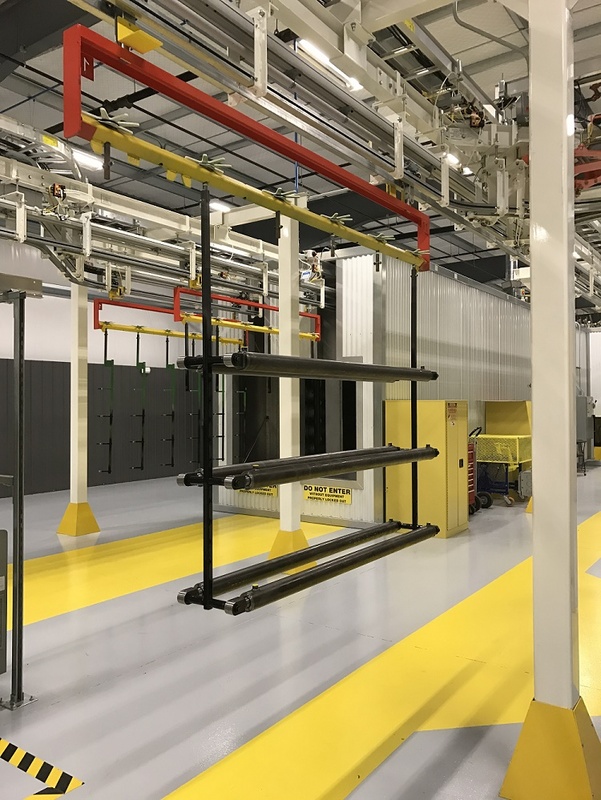 Plans are already underway to expand the system with an additional powder coat line, which will increase capabilities and open up new markets. Opportunity: Always looking to improve their processes, this finishing company was challenged with developing the best shot blast process to meet the stringent requirements of their aerospace customers. 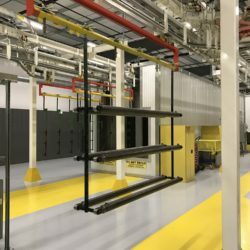 Solution: A custom, totally unique, IntelliTrak 500 Series Overhead Conveyor with a 1500 Shuttle gave them just what they needed. The ability to load various size parts, run them through the shot blaster (at variable speeds), rotate the carrier 180° and run back through the shot blaster in one single line. This proprietary process has helped earn them several prestigious aerospace certifications and a World Class Finishing / Pride In Excellence Award from their customer.